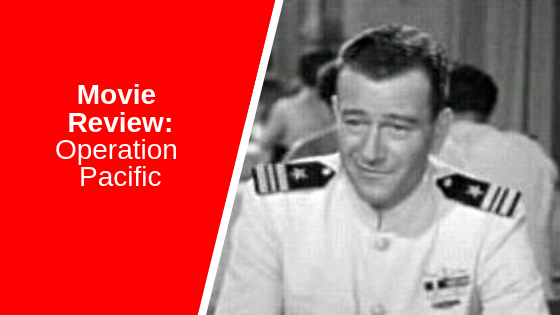 Released in 1951, Operation Pacific is a World War Two submarine drama starring John Wayne, Patricia Neal and Ward Bond, directed by George Waggner. American submarine Thunderfish is tasked with transporting a group of nuns and children, which includes a newborn baby whom they name “Butch”, to safety. On this journey the crew, including Commander Pop Perry (Bond) and Executive Officer Duke Gifford (Wayne) become quite attached to their young charges, particularly baby Butch. Before they reach the safety of their destination, they sight a Japanese aircraft carrier and try to attack, but a problem with their torpedoes means they have a narrow escape from disaster. While in harbor, Duke goes to visit the baby and at the hospital runs into his ex-wife, Navy nurse Mary Stewart (Neal). The spark between them reignites, but Mary is reluctant for anything to develop as she is now involved with Navy pilot Bob Perry, Pop’s younger brother. The Thunderfish is sent back out to sea before anything further can happen. I won’t go any further into the plot because actually, Operation Pacific is quite a complex film in some ways, dealing with a real military problem in misfiring torpedoes and the investigation into why, alongside human relationships and frailties, and I wouldn’t want to spoil anyone’s viewing experience. Some war films depicting World War Two events, even loosely, can be either rather simplistic or overblown, however Operation Pacific is not one of them. It hides away under the heading “submarine picture”, but I feel it is an underappreciated gem. It should be more widely held alongside some of the favourite, perennial war films that we all refer to with a rose-tinted glow as being classics. It has all the hallmarks of a great movie, including action, drama, suspense and even a little romance. Nicely balanced between action and drama, Operation Pacific has both light-hearted and intense moments, and certainly left me feeling satisfied.